So, Lil' Bow Wow … I mean Bow Wow … I’m sorry … Shad Moss says he’s not black. Let it sink into your brain. Just let it sit there. #NotBlack. 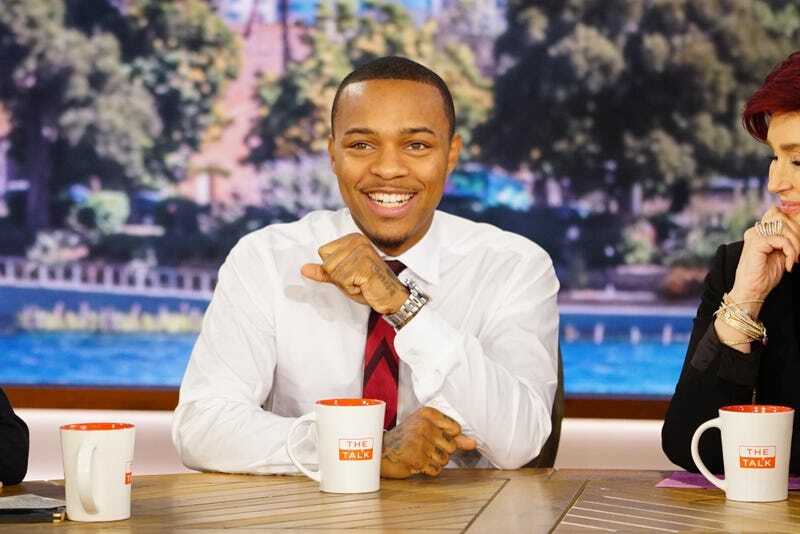 I expected Bow Wow to say that he was not an actor or a rapper or a TV host. All of those claims would have been a self-effacing truth that I could get behind. Had Bow Wow just come out and said, "Look, I took Disney, white mothers who play black rappers' music for their children, and BET for a ride," I would have been like, "Finally, some refreshing honesty that I can enjoy." Nick Cannon does it all the time, and I respect him for it. Recently, Bow Wow pulled a Mariah Carey—or is it a Raven-Symoné (hell, I don't even know these days)?—and apparently he is digging deep into his lineage to claim mixed heritage, thusly removing himself from the black camp. He then shared on Instagram a photo of a light-skinned man with C-grade hair and wearing a wifebeater, stating that said man was his father. I'm not sure how a black man and a black woman don't make a black son, but I also failed Intro to Nutrition in college, so there is that. But Lil' Shad isn't wrong; he alludes to not being black as if he's just a n—ga from Columbus, Ohio, trading in thug culture and we need to make the distinction. N—gadom is the lowest grade of black culture and the most highly commoditized in terms of characteristics. White America loves black thug culture. It trades in it and adores it while secretly fearing it. It is the underlying cause of cops’ shooting unarmed black men, women and children. It's the unnamed reason that white cops claim they fear for their lives, and white folks who trumpet "Blue lives matter" agree. And Lil' Shad made a career trading in the culture and was all thugged out when he was rapping under the name "Kid Gangsta," the stage name he had before Snoop Dogg anointed him "Lil' Bow Wow" when Lil' Shad was 13. The transition that Lil' Shad is trying to facilitate isn't one from black to nonblack; it's actually from baby thug to whitewashed C-list celebrity. There is no money in being black, and Lil' Shad knows this. Being black means standing up for black issues and possibly losing endorsement deals. Being black requires a level of social consciousness that doesn't allow you to sidestep issues. Being black is draining, and at this stage in his career, he can't trade in gangsta culture anymore. Remember when he broke bad with Touré (yes, the journalist Touré)? And when he and Charlamagne tha God exchanged heated tweets on the Twitters, during which Lil' Shad exclaimed, "I'm not Stunna, I'm the wild one"? Lil' Shad tried to trade in adult thuggishness; he got clowned. He used to be a sideshow, the kid at the cookout who could do all the latest dances. He was a novelty as a rapper. Like, it was cute that the little boy knew all the lyrics to his own song. The problem for Lil' Shad is that even as he aged, he still looked like a 13-year-old, and the problem for a rapper wanting to be taken seriously as a rapper is that his novelty became a joke. So this is Lil' Shad's play into relevancy. I get it. Not everyone wants the burden of being black. It can be daunting. I mean, white women want the hairstyles, lips, dances, fashions and asses of black women, but they don't want the struggle. Blackness is Apple on Wall Street; it is the darling of cultures to appropriate. But make no mistake about it: Lil' Shad didn't trade in blackness; he traded in baby black thug culture, and the distinction must be made. So for him to leave Team Black isn't a loss. Let him join the ranks of celebrities who found that their lineage includes 1/118 of “other” and jumped on the mixed bus. Mr. 106 & Park can now call himself Mr. Gentrifying Brooklyn. He can start on his skin-lightening regimen and work on reading his monitors. It's almost time to get himself all gussied up for the impending gala I'm sure he's hoping to be invited to. Goodbye, Lil' Shad; the cookouts won't be the same.